At the close of last 2015 the use of lead stabilisers in PVC-U was banned, the regulatory controls under REACH slipping quietly into force. That the industry in Europe had almost entirely switched to calcium organic stabilisers years before the deadline, is testimony to the effectiveness of the VinylPlus campaign to promote industry change and its efforts to lobby the EU. So with one of the major blocks to acceptance by the environmental lobby now laid rest, is there scope to re-brand PVC-U from the target of Green Peace to ‘Green plastic’? “Around 70 per cent of PVC-U produced in Europe goes into construction”, says Keith White, Managing Director, aluplast in the UK. He continues: “In ending the use of lead stabilisers and the shift to calcium organic, it’s very difficult to argue that the industry hasn’t ‘cleaned up its act’. That represents a very real opportunity to reposition PVC-U products as the ‘green’ and sustainable option in building materials. According to Recovinyl, its network recycled more than 474,000 tonnes of waste PVC last year. But while a sizeable step forward to its target to recycle 800,000 tonnes of waste PVC by 2020, it also serves to highlight the question of where is it and the legacy stabilisers, fillers, pigments and other additives that it contains going? “What we have hit is a really critical point. The industry has actually been pretty good at recycling for some time, initially waste material from the extrusion process, then the 10 to 12 per cent of material lost in fabrication and in the last 10 years, the conscious effort to recover end of life material”, says Keith. “This now accounts for around 35 to 40 per cent of material recycled by the industry, a percentage which is only going to increase as we see growth in window and door second-time replacements. But herein lies the challenge. PVC-U extrusion as we know is a ‘dark art’. Profile performance is dependent on the strict control of its formulation and by definition, recycled material is an unknown quantity. “If you don’t know the ratios of the formulation you can’t possibly predict how it’s going to perform in extremes of temperature. The differentiation between metal salts or stabilisers can be really very significant. Aluplast’s core offer is built around the five chamber Ideal 70. ecotech 70 is the systems company’s calcium organic stabilised, ‘green’ offer, which neatly side-steps the challenges created by recycled material by using it only in the core elements of its product where dimensional stability is less critical. “One of the definitive advantages that we’re able to deliver to our customers is that having continued to invest right throughout the downturn, aluplast can guarantee surface appearance, finish, quality and gloss. The technology used by aluplast to manufacture the ecotech Ideal 70, was 10-years in the making. It simultaneously uses two extruders, which push recycled and virgin material simultaneously through a single dye to create the profile. This locks recycled material away from areas of the frame visible to the end-user or which perform a structural role. “It’s been a significant commitment in the creation of special dyes and the increased investment in running two extruders simultaneously on a single profile but the commercial advantages it delivers to our customers makes that investment very much worth it”, says Keith. 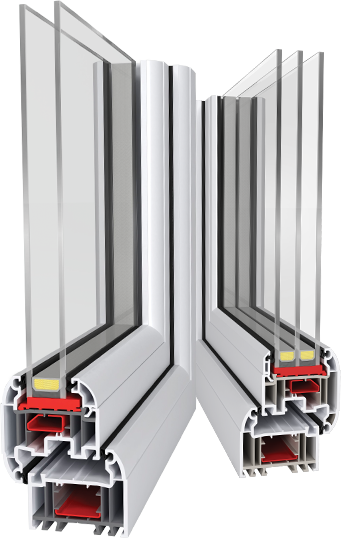 With a choice of 24mm to an impressive optimum 44mm glazing options, the slim line ovolo ecotech Ideal 70 profile, easily accommodates triple-glazed systems, which in common with the Ideal 70, means that it achieves a low U-Value and WERs A++ rating with standard components. Offering bespoke foils within 15 working days or less, it has also developed a diverse colour palette plus, different textured options, something which, given forecasts for growth in colour, will also have immediate appeal with fabricators. This is despite travel time from the continent and something which puts the service on a par with – if not better than – the services offered by leading extruders based here in the UK. “There’s significant and growing demand for foiled wood grain and colour finishes. aluplast has approached product development holistically, rather than a as a single strand. “Sustainability needs to be about economic and commercial opportunity – it’s not just about ownership of a process. There is no point developing green products in isolation, you simply won’t offer value to your customers. For more information on aluplast call 01684 273401 email orders@aluplast.co.uk or visit www.aluplast.co.uk.